For making a recipe for an item like a sword or a shovel you need to make 3 recipes: a recipe when the sword is at left, one when it's in the center and one when it's at right. When you want to make a recipe for an axe or a hoe you need a lot of recipes. This causes a lot of similar mod elements and JEI recipe duplicates. So, can you add an option for recipes to make them "smarter"? Raol, thank you for opening a ticket for this. I will work on recipe optimizator and hopefully release it in one of the next updates. Also here is example from my mod, its crafting of twigs that uses custom planks but this recipe modifications allows them to be arranged it the same pattern as vanilla wood planks in crafting table. So we do just need to remove empty columns? For most cases that would be the fix, but not for all. When I come up with a good reliable algorithm to automatically do this, I will release a fix for this. 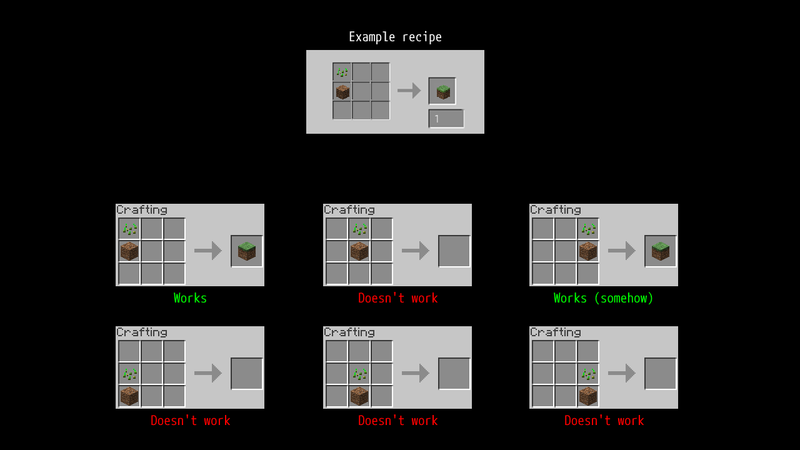 We will add smarter recipes system in MCreator 1.8.2 that will automatically make the recipe work with all variations. I am closing this ticket now.